We avoid mercury, arsenic, and lead exposure, but there’s one heavy metal that we gulp down in smaller doses: bismuth. And if it were less toxic, bismuth could one day keep us from stinking up elevators and other public places with our farts. Heavy metals are exactly what they sound like: metals of relatively high density and high atomic weight. While government regulations have taken the lead out of paint and the mercury out of nearly everything, we can still buy drinkable bismuth. Pepto-Bismol’s effective ingredient is bismuth subsalicylate. Like mercury, it’s an old folk remedy, but unlike mercury it wasn’t abandoned by the modern world. That’s because it actually works to calm upset stomachs and stop diarrhea—though it’s tough to say exactly how. We know that it has antibacterial properties, in part because bismuth targets a group of molecules called sulhydril groups, thereby preventing the formation of certain vital enzymes. However, this strategy will take out a human just the same way it takes out a bacterium. It’s used in Pepto-Bismol because bismuth is far less toxic than any other heavy metal. It actually protects mucus membranes and relieves their inflammation—another reason it calms upset stomachs. But bismuth has other interesting properties. In 1998, three researchers published a paper in the journal Gastroenterology. In a passage that cries out for more detail (and perhaps video), the researchers revealed that they made “homogenates” from human and rat feces, and “incubated” them for a time. Sadly, we are not to see the stink-free age of bismuth. Only three years later, a paper appeared in Emergency Medicine News, reminding people of the dangers of bismuth toxicity. 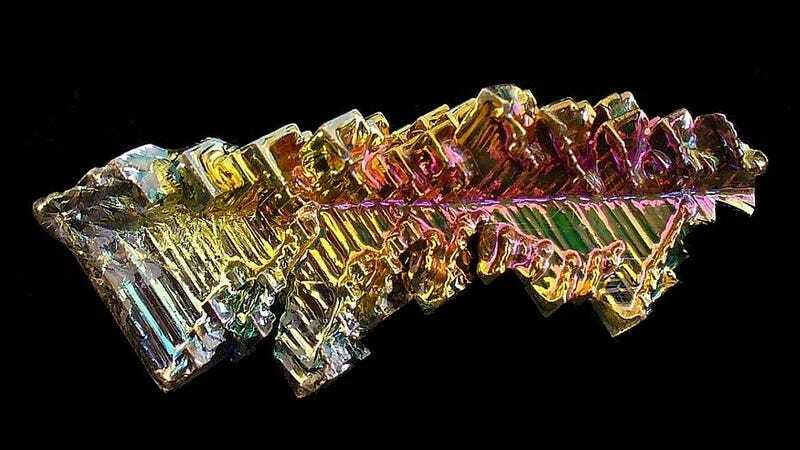 Bismuth isn’t just in antacids. It’s also in a lot of shimmery skin powders. Bismuth oxychloride gives some skin powders the mellow gleam that many women love. And while a day of bismuth-based medicine, or a little powder, hasn’t done any provable harm to anyone, too much will weaken people as it takes out their enzymes. Symptoms of bismuth poisoning include (ironically) upset stomach and lichen-like patches on the skin. It also causes weight loss, fatigue, disorientation, and sometimes seizures. The most tell-tale signs are blackened gums—not to be confused with a briefly blackened tongue, which is harmless and the result of sulfur compounds in the saliva combining with the bismuth. Is there a way to give people enough bismuth to keep their insides smell-free without poisoning them? Perhaps some day. For now, we can only dream.